It’s July! Time for corn on the cob, lazy Sundays, beach trips, fireworks and family vacations! Last year I showed you pictures of revolutionary berries but never showed you how to make them. I got the original idea from Disney Family Fun, but their recipe used white chocolate chips, and I found an even easier way to make them, with Wilton Candy Melts. These are perfect for taking to a BBQ or Picnic because they take about 5 minutes to make, are low cost, and are relatively healthy at approximately 32 calories per berry. Let’s get started! 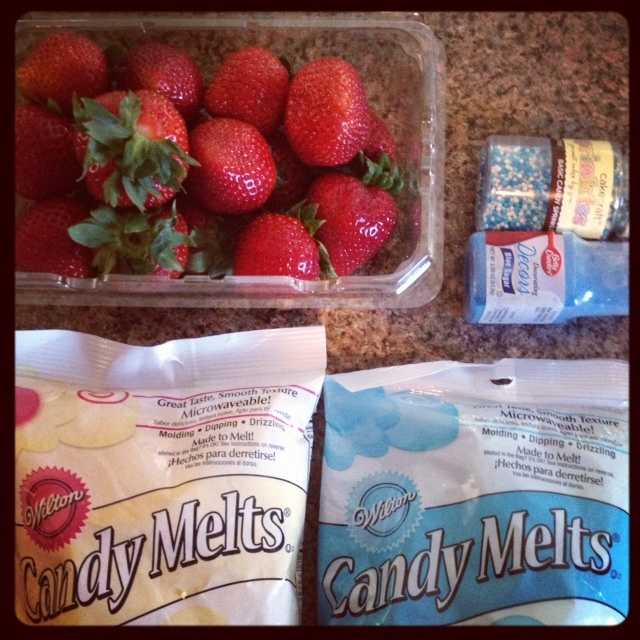 1) Pour about 3/4 cup candy melts into a small, deep bowl. 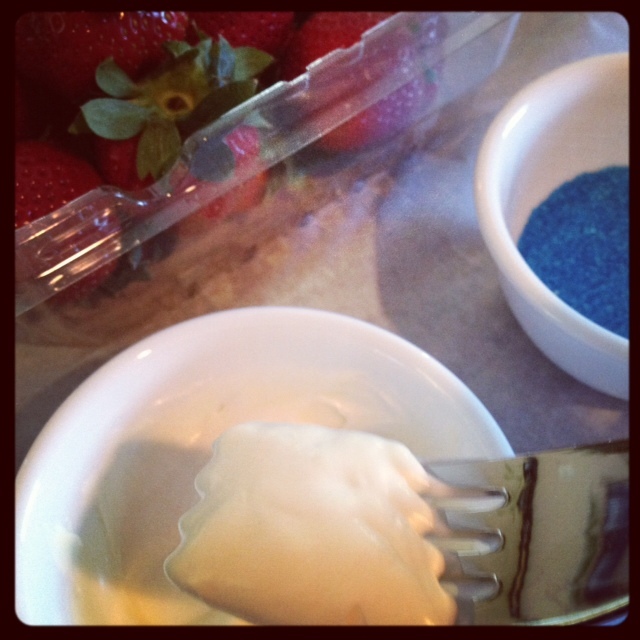 You’ll want deep over shallow so you can dip the berry in and get it about 3/4 coated. 2) Microwave the candy melts for 30 seconds. Check them. If they’re still firm looking, go another 15 seconds. Mix with a fork. When candies melt, you’re good to go. (Mine took about 45 seconds). 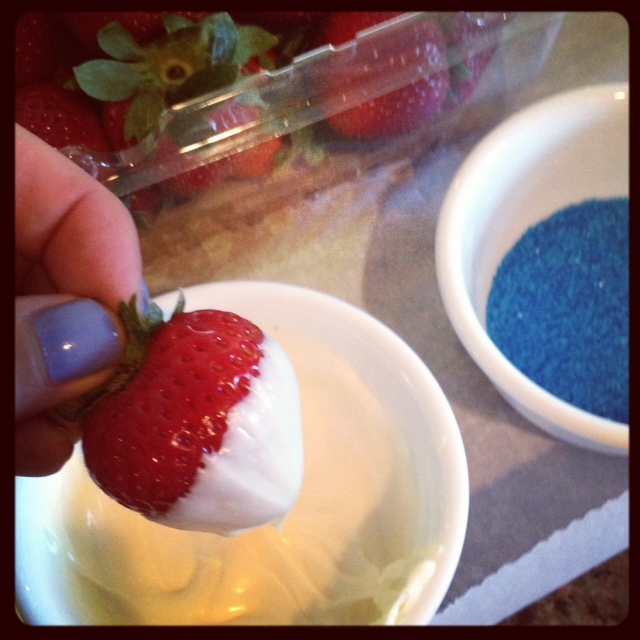 3) Dip your strawberry in the melted white chocolate, until at least half of the berry is covered. 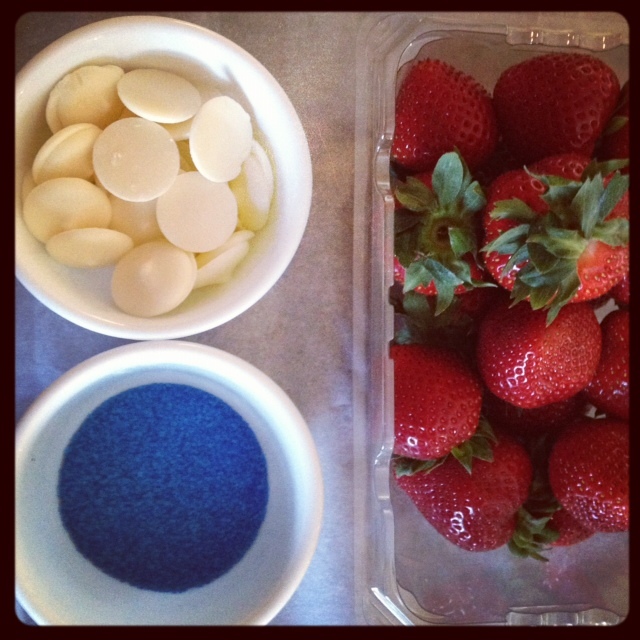 4) Dip the coated berry into the blue decorating sugar. Don’t be afraid to roll it around a little bit if you’re not getting the amount of sugar you want. 5) Keep going, until you’ve covered all of your strawberries! Easy, right? Let the berries harden (about 1 hour unrefrigerated, 30 mins refrigerated) and then enjoy their crunchy, sweet yumminess! Imagine how many different ways you could do this – pink and blue for a baby shower, green and white for Christmas… what a great snack! 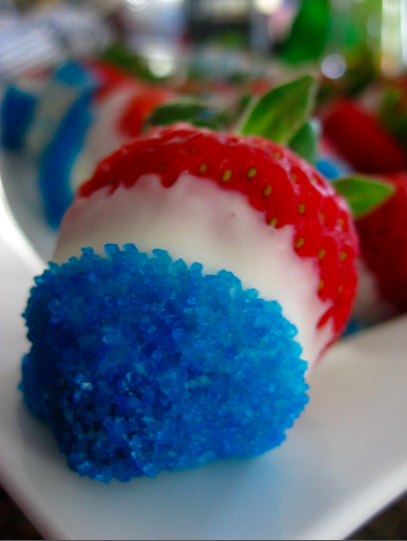 If you try them this 4th of July, let me know what you think! This entry was posted in Food, Recipe and tagged 4th of july candy, 4th of july low calorie, 4th of july strawberry recipe, 4th of july wilton, berries, decorating sugar, healthy 4th of july, holiday snack, red white and blue snacks, red white and blue treats, revolutionary berry, wilton candy melts and fruit, wilton candy melts strawberries. I’m going to a bbq for the 4th. This looks perfect to bring with me! Great idea! OMG! How cute are those?!? If I hadn’t just made a batch of chocolate mint pudding shots to take to a BBQ tomorrow, I totally would’ve made these adorable berries! 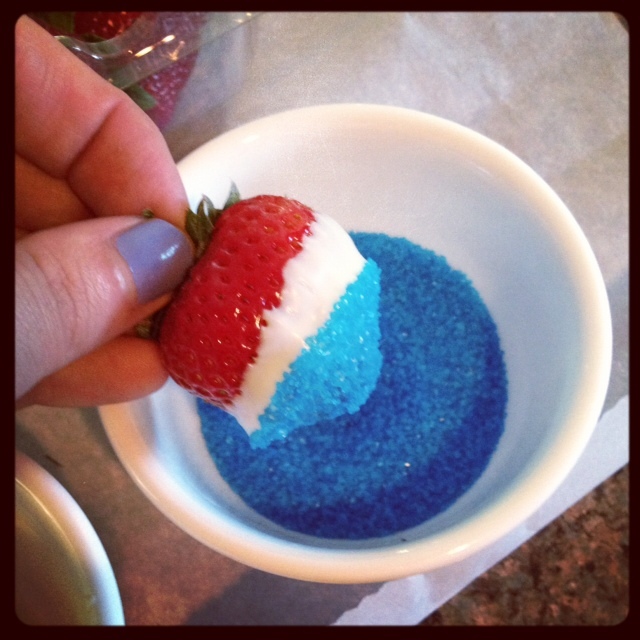 Thank you so much for this great idea for the 4th of July! We are going to a BBQ tomorrow with some of my husbands associates and my hubby was just blown away at how beautiful the berries look. 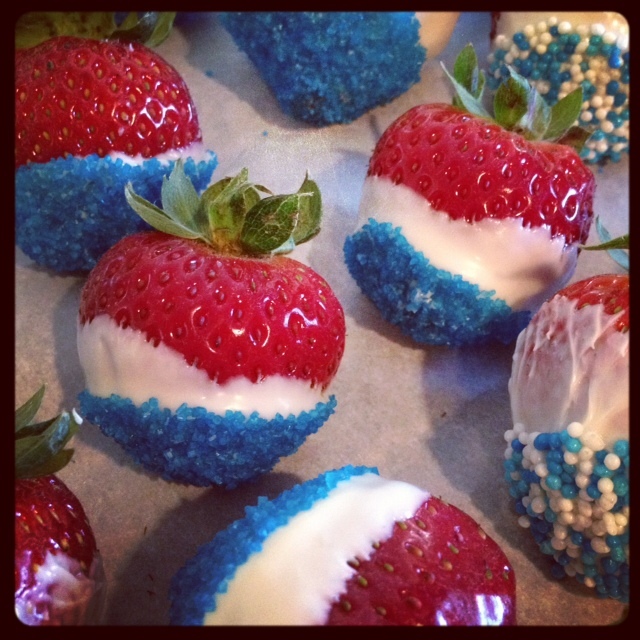 My twelve year old daughter and I made 75 dipped strawberries in no time and decided to also make large stick pretzels dipped in light blue candy melt with red, white and blue star confetti sprinkles. 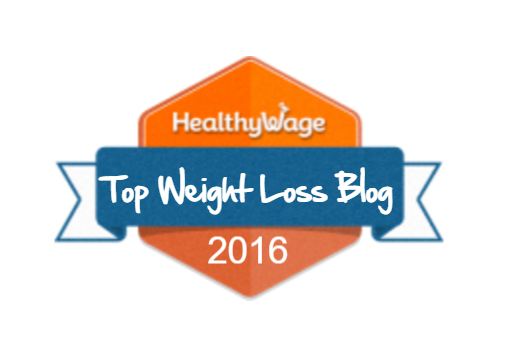 I am no Betty Crocker… so your post has really given me confidence!